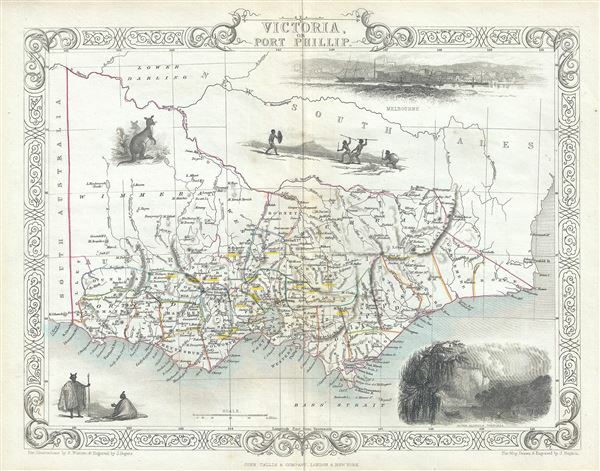 This is a scarce 1851 map of Victoria or Port Phillip, Australia by John Tallis. The map covers Victoria from Discovery Bay east past Melbourne to Mallacoota (Mallagoota). It also extends a considerable distance inland despite the region being only tenuously mapped. Victoria on this map is identified as 'Australia Felix' (the early name given to the lush green pastures of western Victoria). This map was issued in the same year as Victoria became an independent colony separate from New South Wales in July, 1851. This year also marked the beginning of the Australian gold rush, which would attract a large number of international immigrants, tripling its population within the next 20 years. The gold digging sites are marked in yellow throughout. The map includes beautiful illustrations by H. Warren depicting, Melbourne, and the River Glenelg, a kangaroo and indigenous people or Aborigines. The whole has the highly decorative presentation and elaborate border distinctive of Tallis maps. This map was issued as part of the 1851 edition of John Tallis and Company's The Illustrated Atlas, And Modern History of the World. Rumsey 0466.053. Phillips (Atlases) 804.